What happens when my Digital Assistant has an IQ of 300? The scientific study of human intelligence dates back well over 100 years. Since that time there have been numerous schools of thought about how to measure intelligence. The core disagreement between researchers and theorists about intelligence centres on whether it is genetic or largely influenced by the environment; whether it is nature or nurture. The construct of human intelligence is fundamental to the type of society that we live in; intelligence is central to new discoveries, to finding solutions to important problems, and to many other important qualities we value. Numerous questions remain about not just how to measure intelligence but also how to improve intelligence and prevent our cognitive abilities from declining as we get older. 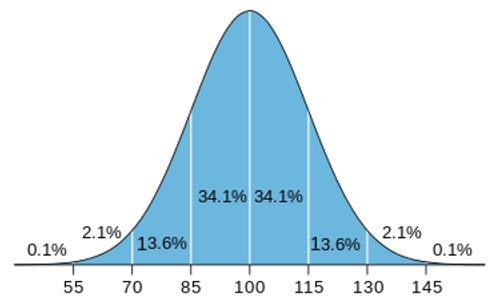 Current Wechsler tests define IQs between 40 and 160. People with an IQ of 130 and above are categorized as individuals with superior intelligence. While IQ tests provide a good indication of a person’s capacity to perform well in an educational or academic environment, it is just part of the assessment of whether a person is fitted to perform well in a business organization. Emotional and social intelligence are other important assets, especially for managerial or team-oriented positions. Nevertheless, an IQ beyond 100 is considered advantageous for securing a well-paid job with good career potential. Due to the application of deep learning, the quality of voice recognition and voice response has made enormous headways in recent years. Tens of millions of Amazon-Alexa and Google-Home bidirectional loudspeakers have been sold, adding home-based information support in addition to mobile smartphone services like Apple’s Siri. These services take on the role of a personal butler, assisting us in the daily tasks such as finding and booking a restaurant, delivering flowers on mother’s birthday or finding a tune which we like to hear. As these services are able to register our mood through emotional sensors, the response can be customized to our emotional condition, increasing the empathy and dependency we experience as customers. The main benefit to the user is to save time, providing convenience and information in performing organizational tasks at ‘zero’ cost. In return the provider of the service is able to access personal information on our behaviour and life-style, which he can monetize through personalized marketing. The more Amazon or Google know about us, the stronger their market position. To enhance this position, Amazon is making considerable efforts to license their Alexa technology to third parties. Ford announced a cooperation with Amazon in January 2017 to equip their new range of electric cars with Alexa technology. Users of the Alexa service can remote start, lock or unlock doors and get vehicle information from the comfort of their home using voice commands. While driving they can access the same services as those available at home through a bidirectional loudspeaker combined with the car’s radio. Advances in deep learning algorithms combined with ongoing research in brain technology will eventually lead to AI systems with human-like intelligence, capable of handling high-level cognitive tasks. Combining voice with other means of man-machine interfaces, intelligence service providers will take on the role of a digital consultant. As employees can be assessed based on the results of an IQ test, it seems reasonable to test the IQ level of AI services provided by tech-giants like Amazon, Google, Apple, Baidu or Microsoft. Comparing these companies’ existing AI systems – and seeing how they stack up against human beings – has been difficult. In a recently published paper – written by a trio of Chinese researchers, including Yong Shi, executive deputy director of the Chinese Academy of Sciences – ­the researchers provide results of a test based on what they call the “standard intelligence model”. Applying this new model, AI systems must have a way of obtaining data from the outside world; they must be able to transform the data into a form that they can process; they must be able to use this knowledge in an innovative way; and, finally, they must feed the resultant knowledge back into the outside world. The test the researchers developed measures a systems ability to handle these tasks. The researchers have also tested humans in the same way which allows them to rank them on the same scale. According to their studies conducted in 2016, Google’s AI had an IQ of 47.28. It came out ahead of Chinese search engine Baidu (32.92) and Microsoft’s Bing (31.98) and had almost double the IQ of Siri (23.94). Notably, none of these systems had a higher IQ than a 6-year-old (55.5), much less than an 18-year-old (97). However, the Google and Microsoft systems have been getting significantly smarter over a period of just two years. In 2014 Google’s IQ score was 26.5, while Microsoft’s was 13.5. The researchers also propose a model for grading and classifying the intelligence of AI systems. Their AI intelligence model ranges from a first-grade system, which is unable to exchange information with humans, to an “almighty God-like” sixth-grade system which continuously innovates and creates new knowledge with infinite IQ values as time goes on. First-grade AI systems have no capacity for information-related interaction with humans, while second-grade systems include smart TVs and washing machines that can control program information but lack the ability to learn automatically. Third-grade systems include computers and mobile phones, which can be programmed and upgraded, while fourth-grade systems can adapt themselves based on information exchanged in the cloud, learning from other AI systems. The fifth-grade represents the equivalence of human intelligence with the capacity for creativity which all systems of the lower grades lack. Finally, the sixth-grade is characterized by intelligent systems that continuously innovate and create new knowledge, with I/O ability, knowledge mastery and application ability that all approach infinite IQ values as time goes on. According to the researchers this reflects the Christian definition of a God who is “omniscient and almighty.” From the intelligent system development point of view, the “supernatural beings” in Eastern cultures or the “God” concept of Western cultures can be regarded as the evolutionary endpoints of intelligent systems (including human beings) in the distant future, the researchers conclude. 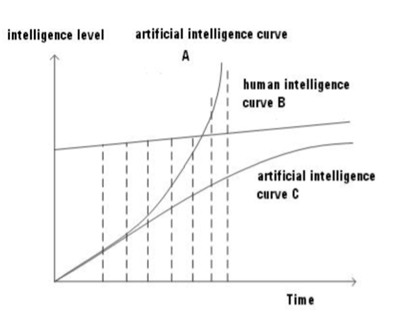 Based on this model of classifying AI systems from grade 1 to grade 6, the researchers see two options of IQ development of AI systems: with curve A the IQ surpasses human intelligence represented by curve B; with curve C the IQ will approach but not exceed human intelligence. The vision of a God-like internet as defined by grade 6 of the referenced paper is also shared by some Silicon Valley entrepreneurs. Anthony Levandowski, the former Google and Uber executive says he’s serious about starting a religion centered around super- smart artificial intelligence. The idea behind his religion is that one day – “not next week or next year” – sufficiently advanced artificial intelligence will be smarter than humans, and will effectively become a God. His “Way of the Future” church will have its own gospel called “The Manual,” public worship ceremonies, and probably a physical place of worship. To enhance human intelligence with machines to reach an IQ level of 300 is a thought-model which does not imply a God-like internet or Superintelligence as discussed in Nick Bostrom’s book. The IQ is an index by which we measure cognitive intelligence. The availability of AI tools to augment human intelligence towards a higher IQ level has primarily economic consequences, for example disrupting the billion-dollar consulting industry of McKinsey and Co. A similar disruption occurred when the introduction of mechanical machines and systems enhanced the physical limitation of humans. A digital assistant will provide consulting services at ‘near-zero’ cost, vastly improving the speed and quality of cognitive tasks. As voice has become the accepted means of communicating with our digital butler, intelligence service providers will need to implement new technologies to enhance communication. Non-invasive brain-computer-interfaces (BCI’s) might be one way to achieve this goal. 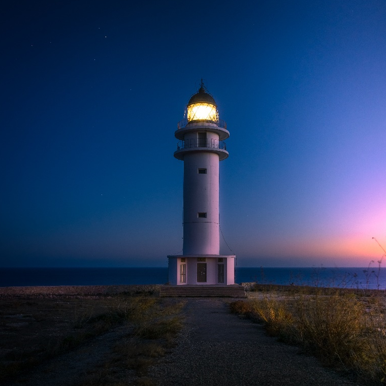 If we maintain control over the application of these devices and services and are able to protect them from criminal attacks, humanity stands to benefit. Considering the complexity of the systems involved, this I not an easy task. Ethics will have to provide the technical, economic, social and individual boundaries to assure the welfare and integrity of humanity. We must reflect on human values as they have emerged through evolution over hundreds of years. To do so we do not need a new religion.